Of course the vendors were out in force. Glenn is having Brainstorm install a chrome dual-hump style bar on his '99. 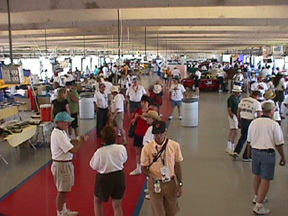 The vendor midway was inside one of the garages at the track. 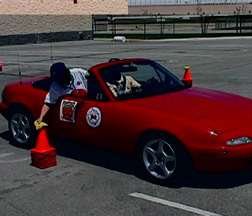 The first event in the Funkana was a blindfolded drive. Here Mary and Greg are starting out. The second event was a football relay. The high winds made it very interesting to throw small foam footballs any distance! 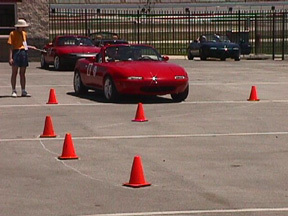 The third event consisted of 5 cones layed out in a star pattern which the driver drove up to and the passenger had to balance a bean bag on top of each one. 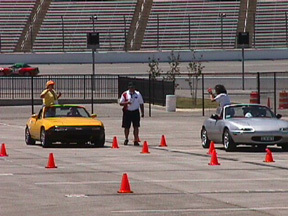 Then the driver drove the course backwards and teh passenger picked up the bean bags. Mary and Greg showing off here. 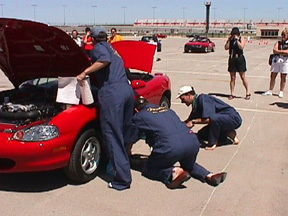 The idea here was to start with the car back at the starting line with 4 sets of coveralls in the trunk. 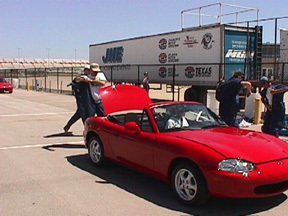 At the gun, the driver pulls the car forward, pops the hood, trunk and gas cap. 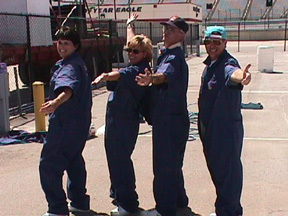 The pit crew dons the coveralls stashed in the trunk. 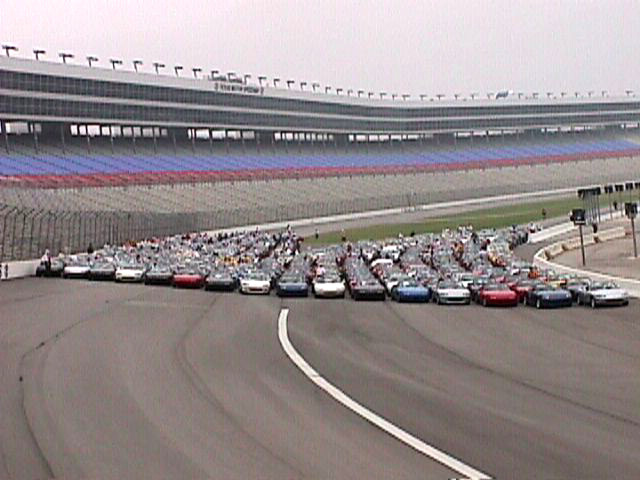 The pit crew then proceeds to swap the two driver's side tires, wash an X off the windshield and close everything up. 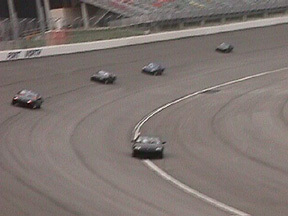 The driver then speeds off to the finish line. After seeing how much fun it was, the rest of the gang decided to try. 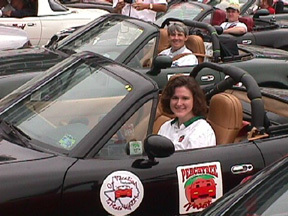 Left to Right: Marge, Diane, Greg and Leo (Sue was driving). 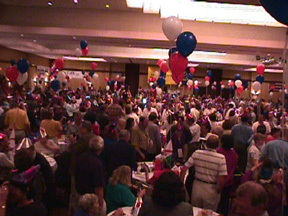 At the dinner the last night, Vince Tidwell gave the first speech. 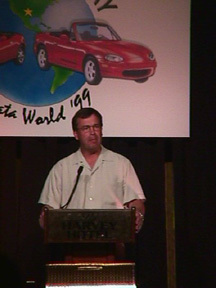 Bob Hall (Skippy Oyster) from Road and Track also talked. 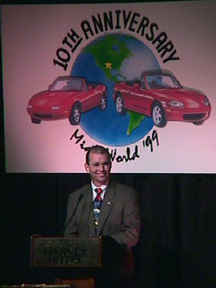 Richard Beattie (President, Mazda North America) gave a hilarious speech and showed us some awesome videos (zoom-zoom!). 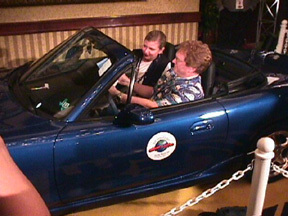 Of course it was the 10th Anniversary, so they had a party and gave away a car! 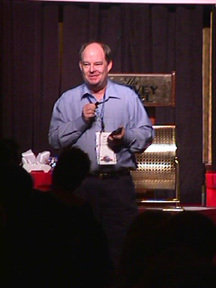 And the lucky winner was...Larry Allen from the Lone Star Chapter. 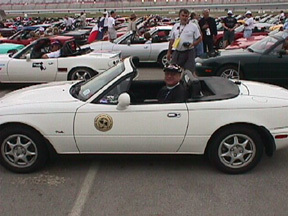 Reverend Jim in his white Miata with the Miatas Across American magnets, playing Handel's Hallelujah Chorus while waiting to line up for the group photo. Monica and Sue in the group photo. 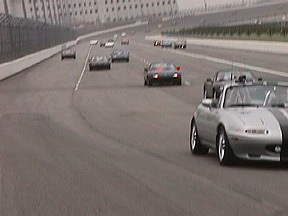 Taking our 0.8 touring laps. Dinner the first night was at the Austin Ranch. 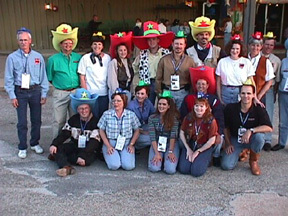 Glenn and Julie brought Miata-sized cowboy hats for everybody, and RAGS is posing with their big foam hats.